The house of the king is near the city. It is inside the city. It is on the mountain. You are under this tree. She is like a princess. We are in the company of the elders of this town. I am behind the church. You [f.] are in front of the house. The land of the king [extends] up to the mountains. He is a prophet among the prophets. 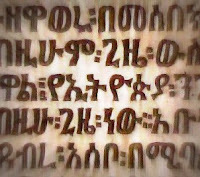 I came across the rich Classical Ethiopic corpus in the course of my doctoral research and was immediately taken with Ge'ez language. There are very few resources on the language and this blog is a step to remedy that by providing an easier entry-point for other Ge'ez-aficionados! I hope you find it helpful in your work and I invite your corrections and suggestions for improvement.